You might have heard of a thing called Pokemon Go. And it turns out that given the $1 million a day revenue that the app is reportedly bringing in, so has Hollywood. The astronomical international success of the iPhone and Android app has apparently kickstarted Warcraft studio Legendary Pictures into renewing their chase for the licence for a live-action movie. According to Deadline the studio had been trying to throw a Pokeball at the Nintendo licence for a while, and almost succeeded (it must have tantalisingly bounced but escaped at the last minute), but this has sent them back on the hunt. 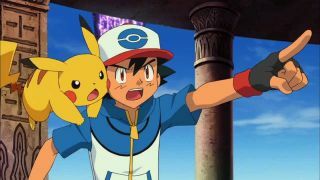 There have been rumours in the past regarding a live action version of Pokemon and given Disney's current obsession with the real-life reimagining of its worlds, it would probably do ridiculously well. Just think of the adorable CGI ultra fluffy Pikachu... and the merchandise. We'll have to wait and see how this pans out. Meanwhile, if you've just started with the game, here are some helpful Pokemon Go tips.